A Kickstarter went off a while back that sold specialized d20 dice for Numenera/Cypher System games . Rather than the usual 1-20 numbers, these dice had Cypher System/The Strange/Numenera levels printed on them. Basically a “level” in these games is equal to three numbers on a standard die. So, a six through eight on a conventional die is a level 2 on a Cypher die, 9-11 is a level three and so forth. The extra marks under the number indicate the actual number. On the blue die below the three+ two dots is the same as nine+two, so this would be an 11 on a standard die. Helpful in game if you get a +1 on the die roll or if you want to use them as standard d20s. All well and good and I used my three dice happily for months. 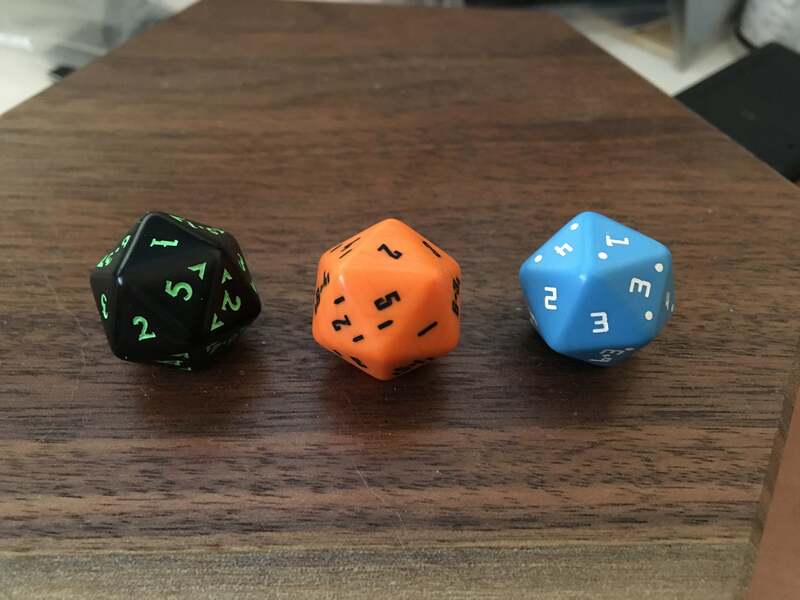 Recently I noticed a distinct lack of success on my die rolls. I am acutely aware of the gamblers fallacy and each roll should have the same odds to get any given number on a balanced die and a string of bad rolls is indicative of nothing. That said, the amount of fail at my game table became statistically strange, at least in my own head. After working at a casino in my misspent youth, I knew that there are ways to test dice for precision and balance. Sadly, professional testing involves exotic machinery not at my disposal. So I found this guy on Youtube using salt water to test for balance on d20 dice. So I broke out a coffee cup, some water and imported Japanese sea salt. (Hey, no comments about the imported salt. It was the only salt I had.) to make the dice float. Spin the dice in the water and see if the same number comes up over and over again. If so, this indicates a balance issue with the dice. Note the numbers currently displayed on the dice; zero, two and two. 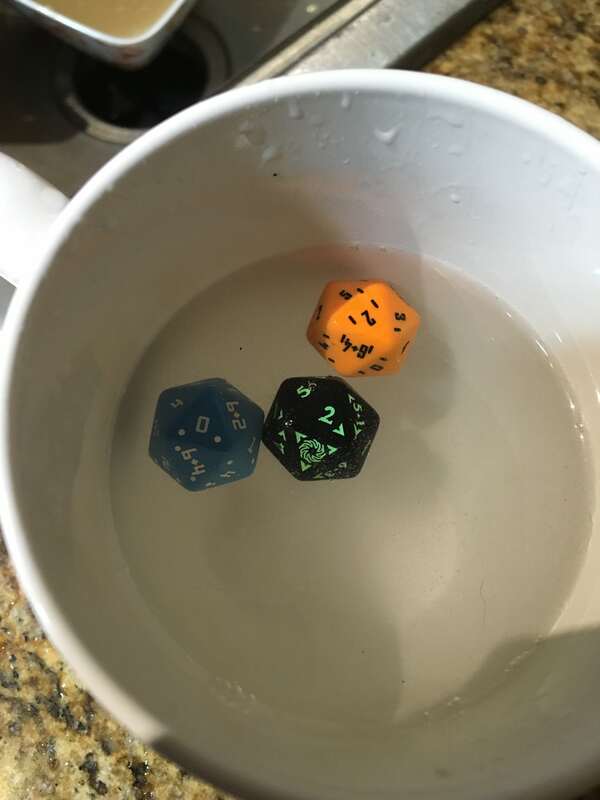 I spun the dice in the water repeatedly. I dropped them into the water from about six inches above the water line. I threw them individually and in groups and no matter what I did they came up zero, two and two. Occasionally one might get “cocked” but the bad numbers were right on the line. It does not mean that the dice will always roll those numbers. It just means that they are not truly balanced and might skew the odds over time. With this experiment I realized I played multiple campaigns with cursed dice. For the first time in my gaming life, my dice actually were out to get me! How many maidens might have survived? How many villains should have fallen to my mighty blade if it were not for these accursed dice? Update: Haaldaar has six of the same dice and found two more that were weighted/skewed. Nine dice in total with five being defective. Yikes! ← Amethyst Quintessence (5E) RELEASED!